The ring I received from Fran Barker designs is no less than breathtaking. Between the many hues of the Tanzanite Gemstone, and its flanking Champagne diamond, there is no shortage of colour, or wonder. The craft-ship is incredible, and well worth the six week wait. I cannot recommend Fran highly enough. About a year ago, I found Fran on Instagram and instantly fell in love with her all of her work! In that short amount of time I have had THREE gorgeous custom rings made! Not only is Fran extremely professional and knowledgeable, but she is really friendly and helpful. She kept me in the loop during the whole creative process by sending me photo updates and little explanations about each production stage. Fran listened to my ideas and created pieces of jewellery that far exceeded all of my expectations! Each ring is made up of different stones, colours and shapes. We made sure that every piece was completely unique to the next one. 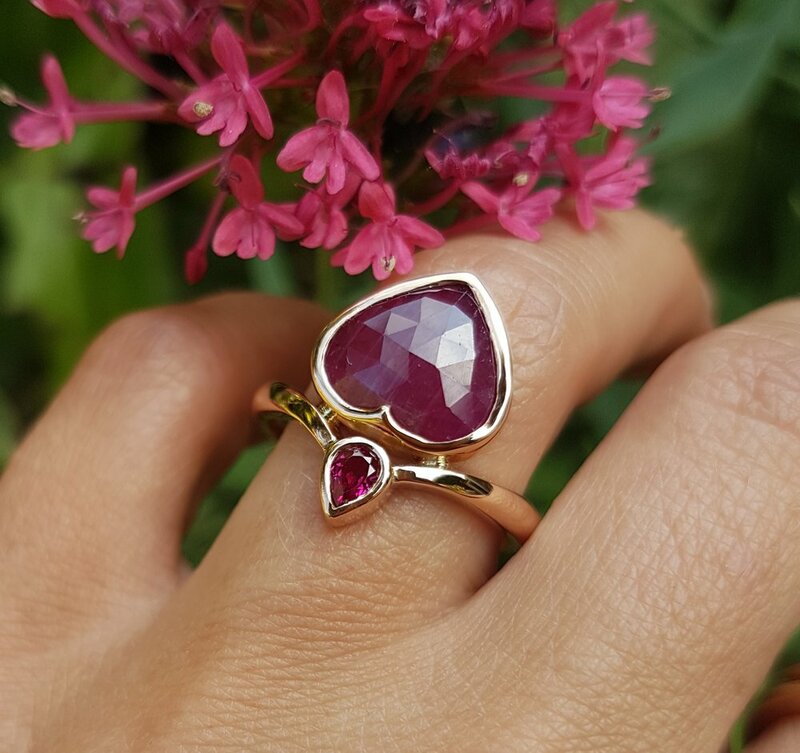 They were made in 18ct and 22ct gold with the finest quality of stones, hand picked by Fran herself! What’s more; convenient interest-free payment plans are available! This made purchasing multiple pieces of jewellery so easy. I’m also from Australia, & so Fran used an insured international shipping option that took no more than five days to deliver! Working with Fran has been very smooth. She is extremely helpful and from the outset everything was really open and straightforward. Her design input is perfect and it's clear that she puts a lot of energy into creating her beautiful art. I am incredibly pleased with the end result and couldn't recommend Fran highly enough. I am so pleased that I didn't buy an off-the-shelf piece because now I really have the perfect ring! I just wanted to let you know that the ring arrived safe and sound. It is so beautiful!!! It fits like a dream. I know that I am going to love every minute of wearing it. Thanks so much for everything! I enjoyed working with you and hope to be able to do it again sometime in the future! I first saw photos of Fran Barker’s designs on Instagram, and I immediately admired the beauty of her pieces as well as the focus on the stunning stones she uses in her pieces. I wanted a ring that was special and unique. I contacted Fran, and she made recommendations and provided ideas. I was contacted at every stage of the process - from selection of the stone, to design options, and I was even able to see some of the work in progress! The fact that Fran was in the UK proved no concerns at all. Fran responded promptly to all of my emails, and her customer service was excellent - including a follow-up to make I was pleased with my ring. Presentation, customer service and most importantly, the ring itself, were and are superior. My ring is stunning. It is a custom-creation for me, and it is everything I hoped to have. 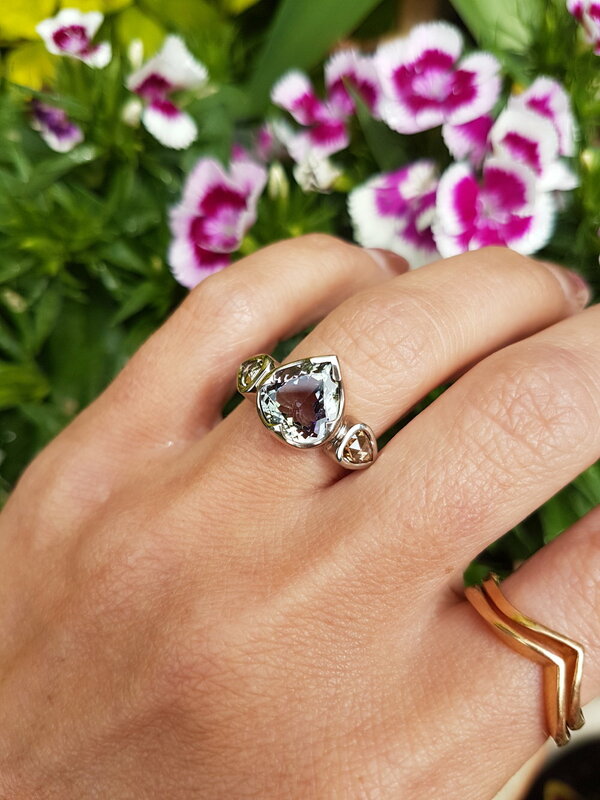 If you are looking for a special one-of-a-kind ring with beautiful craftsmanship, I highly recommend Fran Barker Design. I recently had the absolute pleasure of having a bespoke ring made for my by the uber talented Fran Barker, who I first came across on Instagram. We started with the style of ring - I chose a Mimosa setting. I mentioned a few stones I like, including Ceylon sapphires. Fran then sent some pics and vids of different cuts and sizes of sapphires and it all took off from there. It was such a fun and easy process with Fran answering all of my questions and providing me with updates and lots of pics. My ring arrived in a very stylish box with certificates. It is so beautifully made, the perfect size and fit. It looks amazing on. I love wearing it, gazing at the stunning central stone - it changes colour depending on the light. I can and do recommend Fran Barker wholeheartedly. For a long time I had been wanting to redo my wedding ring. I knew what I wanted, something unique and creative with a vintage flair. Though, I honestly never thought I would find someone who I trusted enough to bring my ideas to life. Enter Fran Barker. I followed her for several months on Instagram, and I instantly knew, if I could choose anyone, it would be her. I was unsure of how the process would ever work though, me being in the US and her based in the UK. My husband encouraged me to reach out to her, and I am so glad. From the first email to the final package on my doorstep, Fran was incredible! She was so patient with all my questions, and design ideas. Fran was very knowledgeable on customs and international shipping, including setting it all up through her account. This alleviated my biggest fear and stress: shipping outside the US. After all the many drawings, emails, and videos/photos of gems, Fran created the stunning work of art that is my wedding ring. I get compliments every day on it. Fran pours her heart and soul into her jewelry and it shows. If you are looking for something that is absolutely one of a kind, look no further. Thank you, Fran! I can't wait to design something with you again. Fran is an absolute gem to work with, I was sent photos and videos through the whole process, she did not stop until she found the perfect sapphire for me, and I am still surprised how beautiful it turned out to be. I've been following Fran on Instagram for a while now and have always adored her work! She seems to create these unique masterpieces and I just had to have one of her creations for myself. The most beautiful moonstones then popped up on her page and they were out of this world. I then contacted Fran and asked if she could incorporate one of the moonstones into a wishbone style ring like one she had posted previously. She was super helpful and came back super quickly and began her wizardry skills. My moonstone turned up in a beautiful box and it just glistened. The stone itself is a really high quality piece that just reflects the light in the most amazing ways. I can't tell you how in love I am with this ring. When I get the chance I'll be making sure I have another one of Frans pieces to add to my collection. If you’re looking to purchase a ring of any kind then I would extremely recommend the services of Fran Barker. I approached Fran after visiting her website for some inspiration and in my head I knew I wanted to create a bespoke engagement ring for my fiancé but unfortunately I didn’t know where to start. Fran was extremely helpful throughout all stages of the process, from a polite and detailed introduction regarding what options are available, followed by beautiful drawings to help progress the design, finally helping an indecisive customer fit in some last minute changes and not once was I made to feel awkward in anyway. I am very pleased to say that my fiancé was over the moon with the final ring and I couldn't thank Fran enough for delivering such an amazing piece. With Fran I have definitely experienced the most professional and friendly service I have ever come across and I would completely recommend her to anyone who is looking for a unique and special ring for any occasion. 'How my ring came to fruition? First I should mention that I do not wear a lot of jewelry and I am very particular about the pieces that I do wear. I prefer gem stones rather than diamonds, in particular blue sapphires. One day I was perusing Instagram for ideas and came across one of Fran’s designs and with a little time and effort I managed to find her website. I was immediately mesmerized by her work and I hoped that we would be able to collaborate on a piece that would be very special to me. The first step was to send a brief message to simply ask if she would consider designing a ring for me and also to tell her that I lived in USA. The second bit was the concerning part, I was unsure if the distance would be a factor or not. She responded immediately and without hesitation that she could and would be happy to work with me and the distance would not be a hindrance at all. As they say the rest is history. So we began the process based of the fact that I wanted a ring created from her Mimosa collection. This much I knew and of course I wanted to use sapphires. It was so fun and exciting to go through the process and to see how Fran was able to take those simple requests and turn them into something so special and beautiful. She created sketches of for me to see. The sketches alone were such striking works of art that allowed me to visualize exactly what my ring would look like. Next we started the process of locating the center stone, which was no easy task. I wanted a cabochon center stone which would be the focus of the ring and Fran showed me multiple options until I found the perfect stone. She did this with great patience and always offered her expert opinion. She was willing to ensure that my ring was exactly what I wanted and what I visualized. Communication was effortless and I never felt anxious about not seeing or touching the stones in person. We communicated frequently and there were so many photos that I never felt left out of the process. I catch a glimpse of my ring and I think how lucky I am to have a one of a kind piece made by such an incredibly talented artist.